Exploring black holes and distant galaxies is thirsty business! 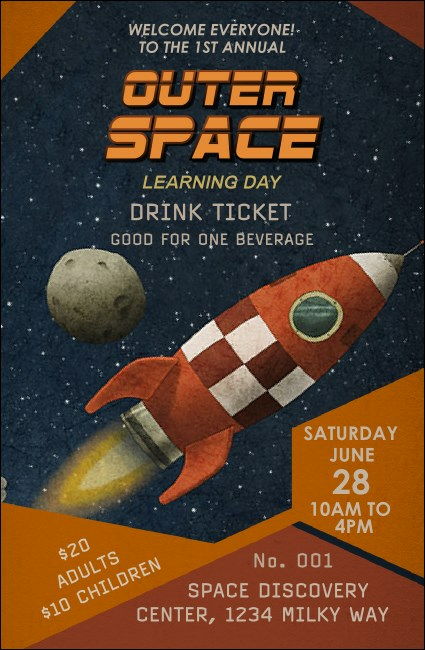 Hand out customized Spaceship Drink Tickets to keep your guests refreshed and ready for more. Presented in space-age-inspired typeface, your event’s details shine atop a classic space travel scene and understated color blocking. Tailor this design to your needs by clicking the customize tab above - we’ll print on top-quality card stock and ship. Size approximates: 2.71" by 4.14"
Gift your guests with a frosty beverage! Order drink tickets customized to your event from TicketPrinting.com.